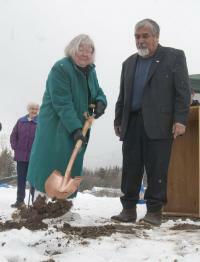 Sarah McRae, widow to CSM Howard McRae, breaks ground at the new Soboleff-McRae Veterans Village in Haines Saturday. Photo by John Hagen. Veteran’s services and especially long-term veteran’s housing options are scare in rural Alaska. But a private venture fueled by state funding is taking inspiration from two local veterans to make local veteran’s housing a reality for the Southeast communities of Haines and Klukwan.